Junior and Ruth Borkholder of Breman, Ind., are shown at the National Farm Toy show held November 2-3, 2012 in Dyersville, Iowa. 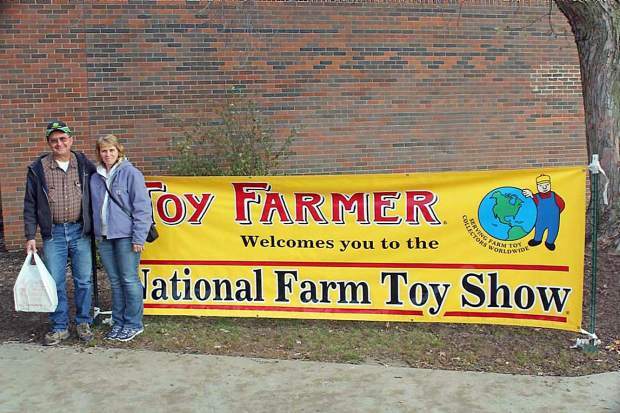 The 35th National Farm Toy Show (NFTS) was held in early November in Dyersville, Iowa. 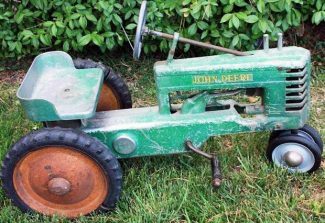 Known as the Farm Toy Capital of the World, Dyersville is the birthplace of farm toy manufacturing. The NFTS is a melting pot for farm toy collectors of all stripes. And they gathered from all corners of the world with nearly 12,000 in attendance. "The annual NFTS has become a stupendous event; considered the greatest of all farm toy shows around the world," stated Cathy Scheibe, owner of Toy Farmer Ltd. and sponsor of the show. The NFTS provided the rite for the farm toy hobbyist to convene and reacquaint with friends and fellow collectors. Farm families, both active and inactive, comprise the majority of collectors. Although many collectors have farm connections, they come from every walk of life. Fall harvesting conditions were ideal, consequently, nearly complete by show time. And the unseasonably warm weather resulted in a huge turnout. Vendors and collectors attend the NFTS for sundry reasons. There were those shopping for new toys, used toys, scratch-built toys, toy models with custom features, tractor memorabilia, tractor brand clothing, junk toys with useable parts and new parts to build or customize toys along with pedal tractors, both new and used. Shawn Beauprez, a collector and vendor from Longmont, Colo., has attended the NFTS for 15 years. "The first show I attended in the mid-1990s captivated my interest. I started collecting the toys I played with as a youngster. Today, I not only collect, I specialize in custom Oliver tractors. The exposure for my custom pieces at the NFTS is amazing. I sell many model tractors at the show. The show also helps develop future sales as well. I can't afford to miss a national show," Shawn commented. Auction companies that specialize in farm toys are also in attendance. Mark Sypherd of Aumann Auctions, located at Nokomis, Ill., reflected, "Attending the NFTS allows us to promote upcoming sales through our promotional flyers. 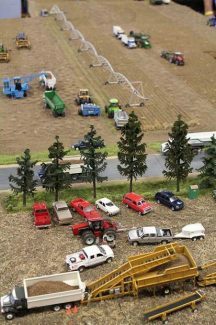 Large farm toy collections are nice; however, hard-to-find and one-of-a-kind custom models provide the greatest interest by the buyer. Farm toy shows and auctions are great places to take your kids or grandkids. Developing a hobby through farm toys is far more beneficial for kids than playing video games or being on the street learning from the wrong kind of people."